Cross Her Heart by Sarah Pinborough is another book that as soon as I saw it I knew I wanted to give it a try after reading Behind Her Eyes. But again before I will get to the rest of the review when finished with this one I know that it is another that will not be for everyone with a definite need for a trigger warning for child abuse. The biggest part of the story is told from three points of view in the present, Lisa, Ava and Marilyn. Lisa is teennage Ava’s mother and Marilyn is Lisa’s co-worker and best friend. But along with those the book does also make trips back to Lisa’s earlier days to uncover what secrets she’s been hiding for years. The book begins giving readers a glimpse into the life that Lisa and Ava are leading with Lisa having been at her job for ten years working alongside Marilyn all the while raising her daughter. Ava’s a typical teen worrying about fitting in with her friends and boys but it quickly becomes apparent there are secrets that each character is hiding from one another and things are about to catch up to them all. Already knowing I had liked the author’s writing style I wasn’t surprised to find an ease of the flow of the story as it went along. The characters also seemed to each hold their own distinctive personalities and stood out from one another. Throw in plenty of twists and turns along the way I did find this one quite the engaging read and would recommend it. Sarah Pinborough is the NYT bestselling and Sunday Times #1 Bestselling author of ‘Behind Her Eyes’ which has sold in over 25 territories thus far and is in development for television with Left Bank productions. She has also written books across a variety of genres including the YA thriller 13 Minutes (in development with Netflix). 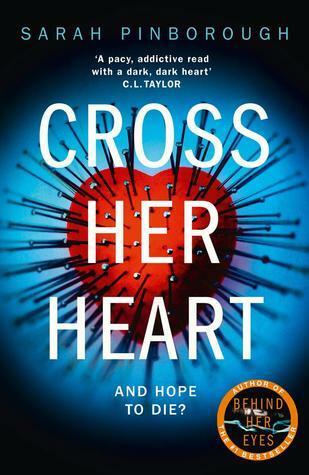 Her next novel ‘Cross Her Heart’ comes out from HarperFiction in the UK in May 2018 and from WilliamMorrow in the US in September 2018. Great review Carrie, thanks for the warning.